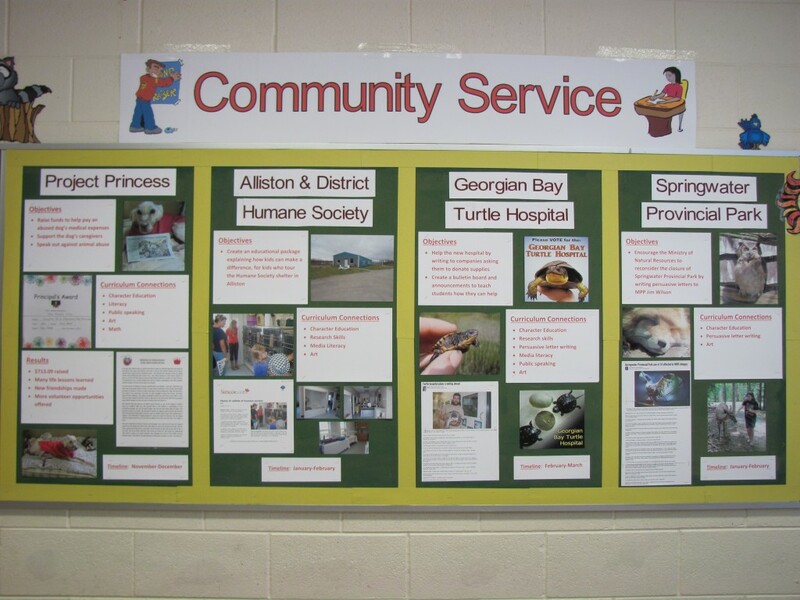 This school year, our class is fulfilling some of the Ontario curriculum requirements via community service initiatives. This BLOG post provides an overview of those projects. 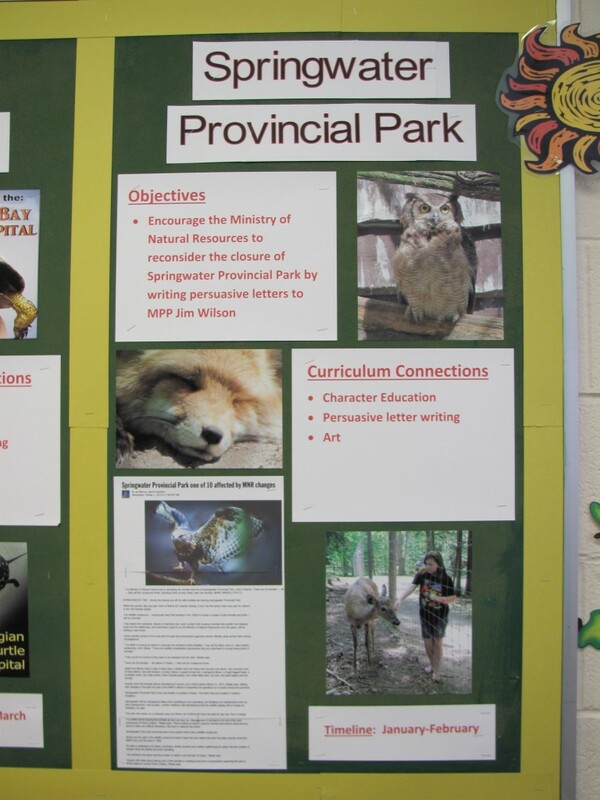 The image below shows a bulletin board in our classroom, summarizing our first four projects, all having to do with nature and animals. We followed these projects with three more to benefit people in need, and then another project for a local wildlife rehabilitation centre. "Project Princess" involved raising funds to help pay the medical expenses of an abused dog that was rescued from a roadside in the Alliston area, and providing moral support to her caregivers. Even though Princess passed away six weeks after she was rescued, helping her was beneficial to everyone involved and produced an opportunity for some additional volunteer work for the Alliston & District Humane Society. Princess' foster Mom (Pattie Dawson) and her two children visited our class on Friday, January 18th, to thank us in person for our support. Pattie purchased a pizza lunch for the class, and I provided a cake from Mariposa Market. 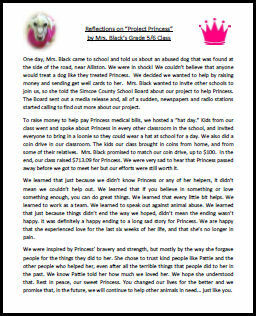 Pattie's children read a poem that they will be sharing at Princess' memorial and four girls from our class read the reflections our class wrote about "Project Princess." Kyle read aloud his narrative, a fairy tale about a dog named Princess. Pattie presented "Princess Ambassador" certificates to the students, and flowers and a wonderful keepsake to me. 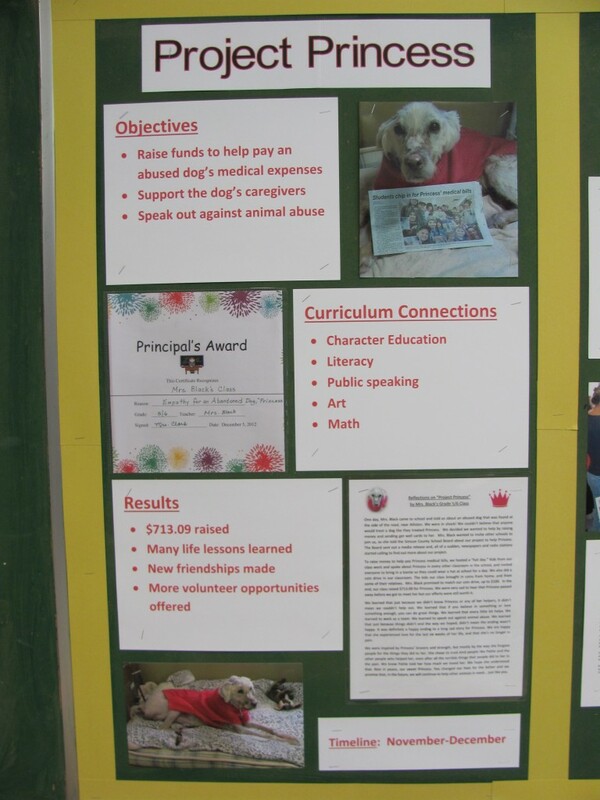 I was asked to speak on behalf of our class at a volunteer appreciation get-together and memorial for Princess, hosted by The Alliston & District Humane Society on Saturday, January 19th. I read the class' reflections at that event. Character Ed 101 Takes on a Life of its Own! 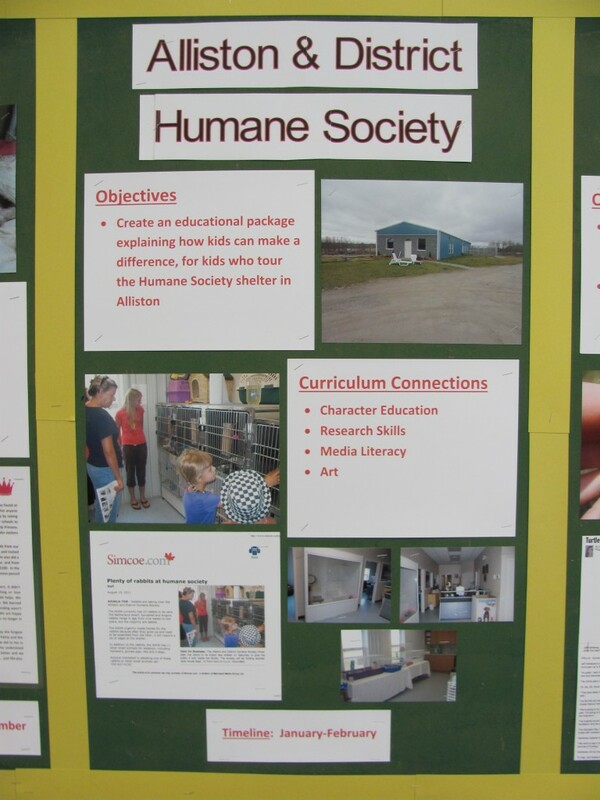 The community service project that was borne out of "Project Princess" involved helping the Alliston & District Humane Society (ADHS) create an educational package about how kids can make a difference. This was a media literacy and visual arts project for our class. After I graded the students' hand-drawn brochure drafts, two volunteers with the ADHS came to class to pick up the brochures and thank students for their hard work. The brochures were taken to the ADHS Board for their consideration. The best ideas will be desktop published and distributed to groups of children (guides, scouts, etc) who come for a tour of the Alliston Animal Shelter. Alliston & District Humane Society Visit! On March 22nd Jeff Hathaway, owner of Scales Nature Park and sponsor of the new turtle hospital, came to our school to make presentations about local reptiles species and to provide hands-on learning opportunities for student from Grades K-8. Our class attended these sessions and also met with Jeff to discuss what the new Georgian Bay Turtle Hospital needed most, and who might assist with donations. After that meeting, students began work on persuasive letters asking local businesses to donate supplies and equipment to help the turtle hospital get up and running. 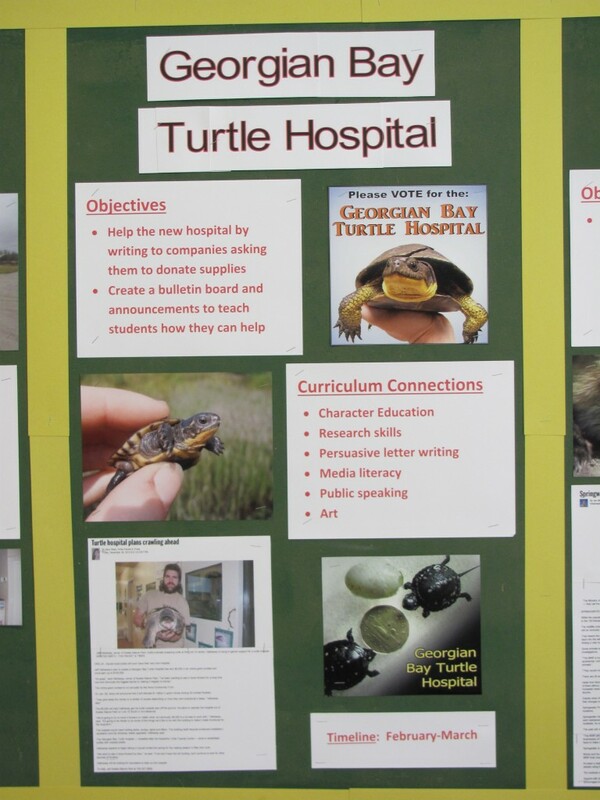 We also worked to educate students in our school about how they can help turtles. With seven of eight species of Ontario turtles at risk, a turtle hospital is a great way to support rare and endangered species. Many turtles that are injured on our roadways just need to have their cracked shells repaired, and to be given pain medication, antibiotics, food and shelter until they have healed. The Georgian Bay Turtle Hospital, which will open in April, will be housed on the Scales Nature Park property, at Highway 11 and 15th line in Orillia. The hospital will be maintained by Scales' staff, volunteers and local veterinarians who have agreed to donate their time. Once turtles have recovered, they will be released back into the wild in close proximity to where they were found. The only other facility in Ontario dedicated solely to treating and releasing injured turtles is the Kawartha Turtle Trauma Centre, a two hour drive from Orillia in Peterborough, Ontario. Last year, KTTC treated and released over 1,000 turtles, including several hundred baby turtles that were hatched from eggs laid at the centre by injured turtles undergoing treatment. The turtles shown below were treated at KTTC. If you click on the pictures, you will be taken to articles about KTTC and its patients. A community service project involving Springwater Provincial Park was suggested by Kellie and Allisa, in our class, who are sisters. They had heard in the media about the potential closure of a beloved local park. Kellie and Allisa have fond memories of visiting this park with their family and didn't want the park to disappear. Our class wrote persuasive letters to MPP Jim Wilson, urging him to do whatever he could to help save Springwater Provincial Park. 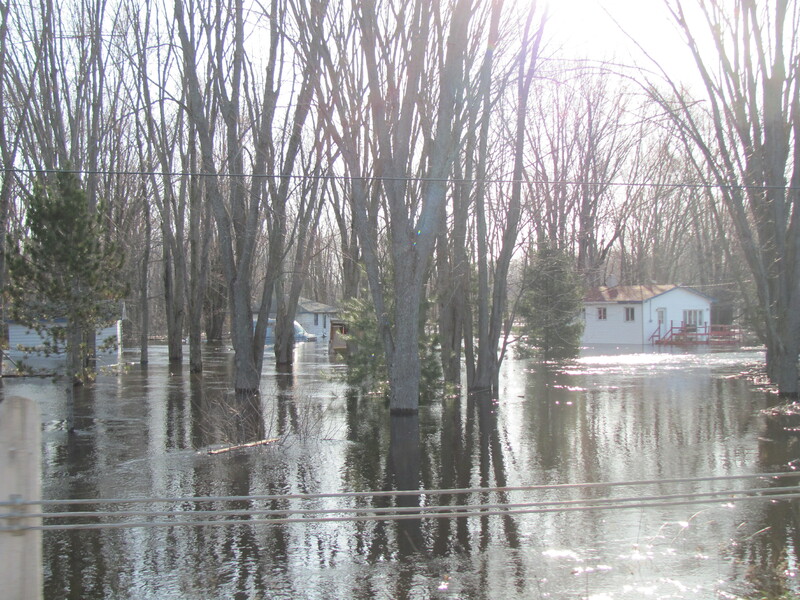 The post above was updated on March 22nd to include scans of two letters we received from MPP Jim Wilson in response to our letters about Springwater Park. We were not able to convince the government to keep Springwater Park open, but we did receive assurances that the animals in the wildlife compound would be relocated to appropriate new homes (a concern of students), and before the school year ended, we received word that the MNR had made good on that promise. All of the mammals that the children had grown to love through their visits to Springwater Park were relocated to Aspen Valley Wildlife Sanctuary, in Rosseau, Ontario. 5. COUCHICHING JUBILEE HOUSE "BOWLS FOR BEDS"
"Couchiching Jubilee House is a Transitional House for women located in downtown Orillia. Founded in Jubilee Year 2000, the House offers four furnished apartments to vulnerable women and their dependent children, providing a safe, supportive and affordable environment for up to one year. The women come from varying backgrounds, ranging in age from 16 to mid 50’s; teenage Mom’s, women fleeing from abusive homes, women without the means to help themselves." 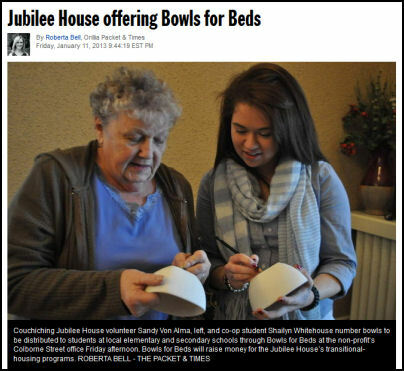 This year, Couchiching Jubilee House participated in a fund-raiser called "Bowls for Beds." On Friday, March 4th, Mrs. Thompson's Grade 6/7 class and our Grade 5/6 class painted ceramic bowls to help with the fundraiser. After students received art marks for their efforts, volunteers with Couchiching Jubilee House took the bowls back to Orillia to be fired, so they could be used at a soup tasting event at Twin Lakes Secondary School. Many students and their parents opted to purchase tickets for the event at Twin Lakes Secondary School. Those students picked up and used the bowls they had decorated. The rest of the student-decorated bowls were sold to the public for use at the soup tasting event. We want to thank Couchiching Jubilee House for inviting us to learn about the problem of homelessness in Simcoe County, and to help make a difference! 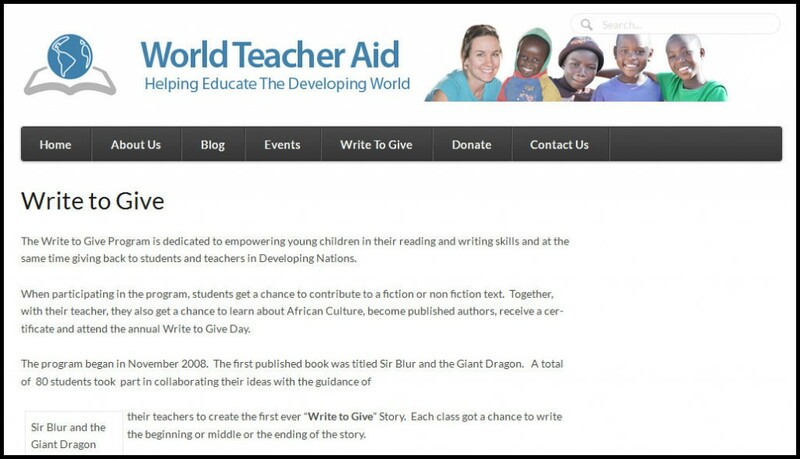 During the first six years of the project, "Write to Give" published 125 different books, involving 5,000 student authors and illustrators. This year, Miss Wigle's class wrote the ending to a story for which the beginning and middle were written by students in other schools. Then, she invited our class to illustrate the book. This is a farm road with a field on either side of it. 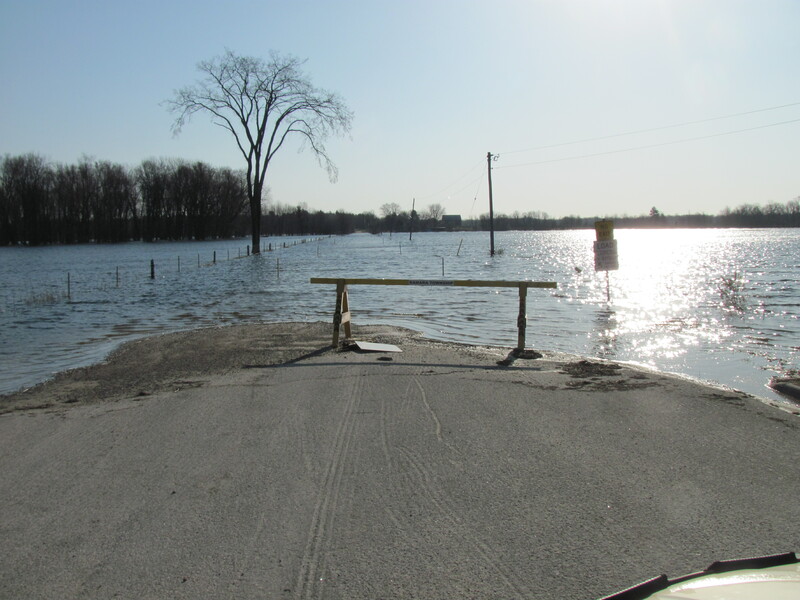 Our school is located two doors from the public works yard, where local residents were invited to pick up bags and sand to help barricade their homes from flooding. Our Librarian, Mrs. Torrey, thought it would be really helpful if sand was already bagged for them. She called Public Works and they agreed that we could be of real help during this crisis. For two days, at as water levels peaked, classes from Grades 5-8 took turns walking to the public works yard to bag sand. Our teacher and class offered to develop school resources for the local wildlife rehabilitation centre and sanctuary where the Springwater Park animals ended up. 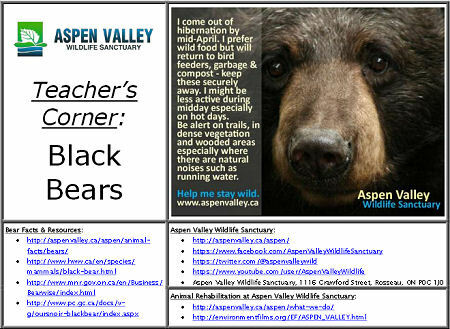 Mrs. Black produced a sample resource about Black Bears, based on a "Help us stay wild" info.-graphic produced by the wildlife centre. Students in our class then brainstormed fund raising ideas and curriculum-based outreach ideas for four other animal species. We sent the wildlife centre links to our sample resource and the blog post showing our brainstorming session. We are now (May 31st) waiting to see if the centre would like us to further develop our ideas for their website. On July 31st, Mrs. Black went to Aspen Valley Wildlife Sanctuary and met with the General Manager and the retired teacher who does school tours. They loved the sample project sheet and the brainstorming work the class had done. They asked Mrs. Black to develop the other four resources using the class' ideas! Watch this BLOG for further updates on our exciting new community service projects in the 2013-14 school year!